The 16 Side Cabinet features the patented Raise & Release drawer latching system with full extension 110 lb. 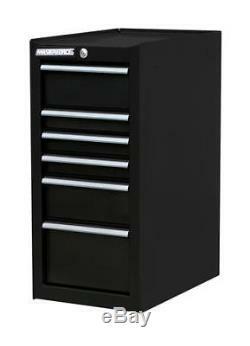 A long lasting powder-coat finish, over 19 gauge steel, makes this tool cabinet built to last. 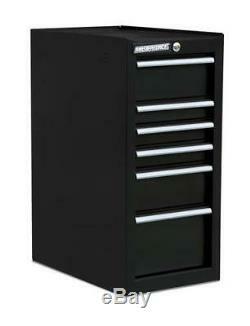 It fits all Masterforce® 30" / 36" / 41" / 46" / 56 tool cabinets. It includes 6,000 cubic inches of storage capacity and has a weight capacity of 450 lbs. Non-slip drawer liners included help keep your tools in place. Raise & Release secure latching system keeps drawers tightly closed and reduces risk of accidental opening. To release just lift the drawer pull to easily slide open. 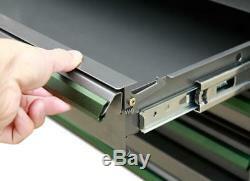 Heavy-duty, full extension ball-bearing drawer slides hold up to 110 lbs. Tubular lock system secures all drawers for safe tool storage. Recommended to fit virtually any cabinet 24 deep or greater. Storage capacity: 6,000 cubic inches. Dimensions: 16"W x 34-3/4"H x 24-5/8D. Includes: (1) 16 Black Side Cabinet, Drawer Liner. Maximum Weight Capacity: 450 pound. Product Type: Side Cabinets & Lockers. Storage Capacity: 6000 cubic inch. Unfortunately, as of August 2018 we became aware that the state of California is enforcing new "Proposition 65" rules. This is simply not a sensible thing for us to do with SOME of our items at this time. We apologize for any inconvenience this may cause. The item "Black Gauge Steel 16 x 24 6 Drawer with Liner Ball Bearing Slide Side Cabinet" is in sale since Thursday, January 10, 2019. This item is in the category "Collectibles\Tools, Hardware & Locks\Tools\Tool Boxes, Chests". The seller is "mosave" and is located in Green Ridge, Missouri. This item can be shipped to United States.